The development discourse in Pakistan is ridden with multidimensional problems made complex by a historical baggage, a culture that hinders empowered problem solving, vested interests, multiple stakeholders, and a lack of policy focus. However, many of these complex problems, at their heart, are quite simple and can be addressed through creative ‘out-of-the-box’ thinking, empowerment, and some inspired activism. The PIF Ideas Contest 2013 seeks to encourage that. Thinking creatively can greatly help facilitate the solution of long-standing problems that seemingly appear to be intractable. ‘Out-of-the-box’ thinking encourages and enables one to work around the limitations or constraints that may have hampered the solution of a problem in the past. Out of the box and innovative solutions could come in many shapes and forms. For instance, power is a serious problem in rural areas. This may force the farmers to use solar tubewells to irrigate their farms. But solar tubewells are costly. Could a technology enable sharing of solar tubewells? Could a lower cost alternative energy solution be found for running tubewells? How could the power of the ‘middle man’ be reduced to empower the poor farmer? Could a low-cost robot be created to support factory workers? Could an innovative technology solution be devised to get around the challenges of e-learning and spread literacy amongst millions? How could the impact of natural disasters be mitigated? How could traffic congestion be reduced? These are only some of the many challenges that can be addressed through creative problem solving and ‘out-of-the-box’ thinking. The PIF Ideas Contest 2013 seeks to inspire people to go beyond the ‘problems mindset’ into the ‘solutions mindset’ and instead of waiting for big policy changes that is often beyond their control feel empowered to think of and act upon small localised solutions that can be achieved. Pakistan Innovation Foundation (PIF) is an apolitical and non-partisan private-sector driven entity charged with developing and executing an analytically rigorous, evidence-based, and deeply passionate agenda to promote science, innovation, and entrepreneurship in the Pakistani society. Pakistan Innovation Foundation is in the process of rolling out a series of activities – Innovation Labs, Ideas Contests, and Innovation Challenges – within Universities and Corporate Sector in Pakistan. DO YOU HAVE A GREAT IDEA THAT COULD SOLVE ONE OF PAKISTAN’S DEVELOPMENT PROBLEMS OR COMPETITIVENESS CHALLENGES? The Competition is OPEN TO ALL – students, professionals, entrepreneurs, or just citizen innovators and ideal-ists amongst us. 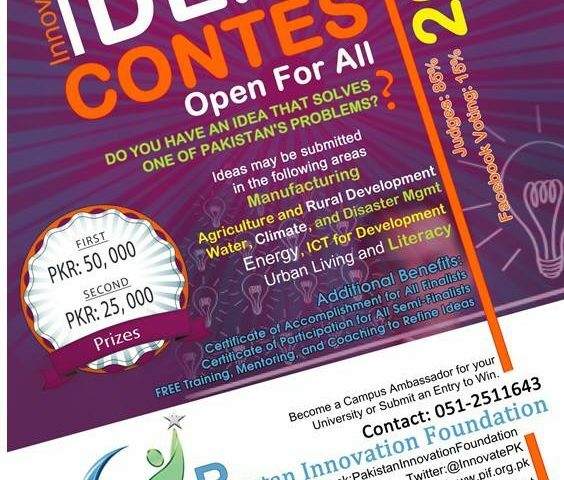 By registering for PIF’s Ideas Contest 2013, you can compete compete against other fellow Pakistanis and may win prize money worth PKR 75,000/- (Read this carefully before registering). In addition, all Finalists receive a Certificate of Accomplishment and all Semi Finalists receive a Certificate of Participation. They also Receive invaluable mentoring, advice, and hands-on training on how to think ‘out-of-the-box’ and gain the skills and network necessary to transform your innovative idea into a real venture that delivers impact. 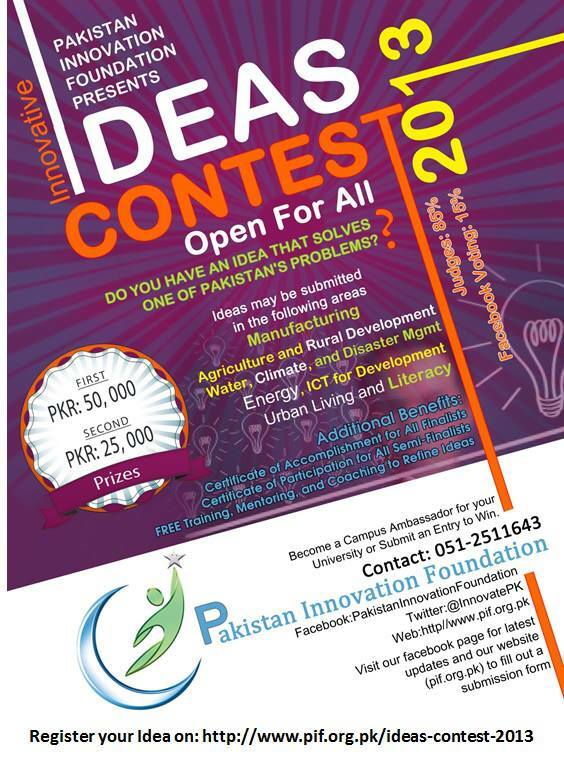 PIF’s Ideas Contest 2013 also opens doors for contestants to compete in our upcoming National Innovation Grand Challenge (NIGC) with a prize money 100x more than the Ideas Contest. Lets unleash the collective creativity and ingenuity of the Pakistani people and work together to create an innovative and more prosperous Pakistan!